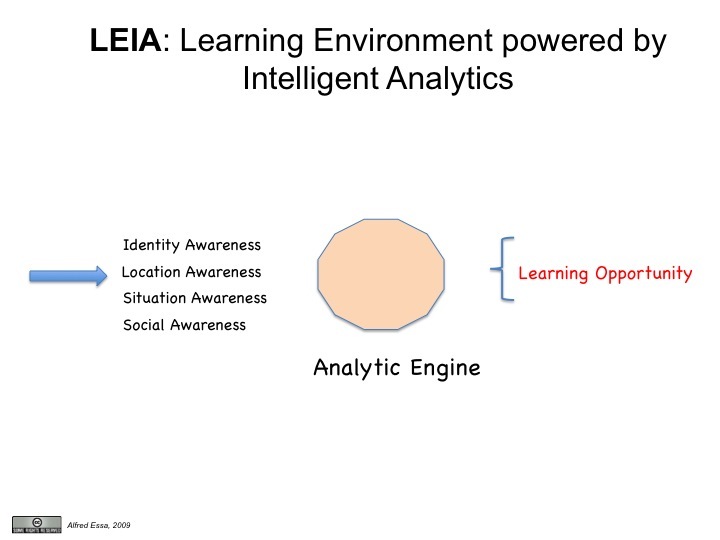 During my Expert Panel discussion today at the Desire2Learn Users Conference I will introduce the concept of LEiA (named after Princess Leia), a Learning Environment powered by Intelligent Analytics. What is LEiA? LEiA is a framework for research, design, and development of the next generation Learning Environment powered by Intelligent Analytics. How does it work? LEiA is an intelligent system, dependent on a set of infrastructure services, that dynamically presents a learner with optimized learning opportunities based on who she is, where she is, the environment and situation she is in, and the people with whom she is connected. Location Awareness. Where I am: my physical coordinates. Situation Awareness. The situation I am in: my context, situation, and environment. Identity Awareness. Who I am: my attributes, past behaviors, learning styles, and preferences. Social Awareness. Who I am with: my friends, peers, mentors, and teachers. What is the Intelligent Analytics part of LEiA? The Analytic Engine is the model which dynamically generates the learning opportunity ("what the learner needs") based on the four input vectors described above.